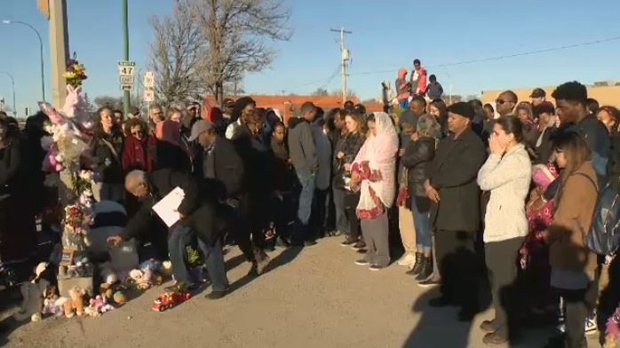 A vigil was held Friday night for a four-year-old girl who was killed while crossing the street on Monday, March 18. Galila was crossing the street with her mother at the intersection of Isabel St. and Alexander Ave. when they were hit by a vehicle. Galila died in hospital the next day. Galila’s mother remains in hospital; family and friends say it’s unclear at this time if she’ll walk again. On Friday her father attended the vigil, which was held at the scene of the crash, where community members gathered to grieve. A memorial has been growing steadily at Isabel St. and Alexander Ave.
People who knew Galila say her life was filled wonder, excitement and energy. “The father now is left, they have one child, who is two years older, that needs to be raised and it will likely only be him now, while at the same time taking care of his wife,” said Aaron Mehzenta, a family friend. He says the Eritrean community will continue to provide support to the family.